Contact us today to help you design the right system to solve your needs! The Electro Discharge (EDC) technique produces a unique pulse of water that is extremely powerful. It can penetrate or break almost any material in its path. 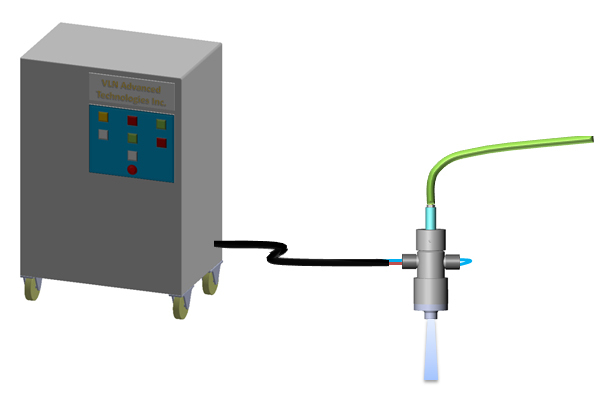 The electrical system used to produce the pulse jet consists of a capacitor bank which stores the electrical energy (like a rechargeable battery), a power unit to charge the bank (battery charger), a quick acting ignitron switch and a specially designed nozzle. The typical system can store 100 kJ of electrical energy at a maximum voltage of 22 kV and is still easily portable and relatively compact. Our EDC systems can be adapted to many applications in mining and military environments including explosive-free rock breaking and ammunition, ordinance and IED disposal.